One of my friends recently wrote a post at a life overseas... and thus you know know the inspiration for this "true confession..."
We'd only been married for a short time when we discovered that our first child would be arriving in time to celebrate our first anniversary with us. Talk about instant delight with a good mix of terror and "Ummm... God, that's not quite the timing we were thinking..."! However, it wasn't look before we settled into our new reality: WE. WERE. PARENTS. No, we hadn't officially met Wrightling #1. Not yet. But our lives had already changed and would continue to so, all because we had a little one on the way. Of course, grandparents on both sides were super excited; hubby's mom squealed and did a happy dance... both grandfathers just looked at us with surprised and goofy grins. My mom promptly purchased a first gift - an Amish rocking chair! I love that chair! It was the one chair in which I could sit after a long day on my feet teaching middle school ...and my back wouldn't hurt. It was my favorite place to be as I sat and rocked my little guy while nursing him or trying to calm the colicky him. It was where we snuggled together on long and feverishly sleepless nights, played peek-a-boo, sang "Deep in the Hundred Acre Wood,..." The list could go on and on. Yes, I love that rocker! And once again, there were those even longer nights after she arrived. I'll never forget the day we found out we could have some space on a container heading to W. Africa. That rocker made the priority list. It became my favorite place to sit down, take a break and pray when I heard the muezzin. At some point during long sleepless nights with Wrightling #6 it finally dawned on me - I could delight in those long sessions of methodical movement and snuggling an uncomfortable one until they metamorphosed into quiet, prayerful moments. After I adopted that attitude, baby more readily relaxed (which meant I did, too). I actually learned to sleep comfortably while holding a little one in that chair. Then came the moment when I realized we were going back to the States without plans to return to W. Africa. I made up a list of "all our stuff to sell." I just couldn't put that chair on the list. Covered with years of finely ground Sahara sand-dust. Splattered in one spot with paint. Permanent marker art could also be spotted if you looked closely. Definitely more than a bit worse for the wear. That chair was, in my heart and mind, worth far more in memories than it would ever be to anyone who might pay a few CFA* for it. The price to ship it back via one of the airlines was more than we could justify. Hubby offered to buy me a brand new one once we got back to the States. I almost agreed to that compromise. 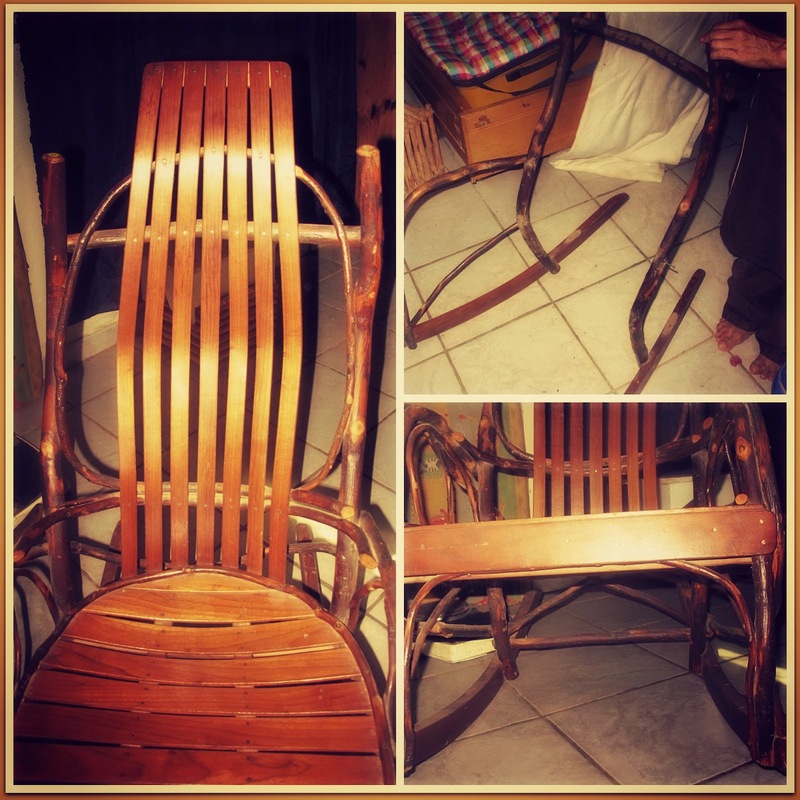 Then, after many hours of staring at that chair and having the tears well up each time, I decided to take that crazy rocker apart somehow, and then somehow pack it in our luggage. People laugh when I tell them that. In retrospect, it is pretty hilarious. I spent at least eight hours, almost nonstop and telling my family to fend for themselves for dinner, trying to disassemble the rocker into small enough pieces that I would then be able to fit into either a foot locker, the largest dimension suitcase allowed, an action packer, a duffle bag... or some combo of all of the above. Hubby certainly wasn't amused or laughing while I frantically worked to tear it apart in time to catch an earlier flight (friends traveling back had a few extra bags and they agreed to transport it for us which also meant it wouldn't have to bounce around Scotland with us on our way home). He was trying to sleep. Then I had the audacity to pull him out of bed and enlist his help to get those last few stubborn pieces apart. At that point, I didn't care if I could never sit in it again because we'd glued the thing back together and had become nothing more than a conversation piece. I just had to get that rocking chair back to Michigan. Thankfully, hubby insisted I take a ton of photos of the chair prior to beginning the demolition thinking we he would have some sort of guide when we he tried to put it back together. Once we unpacked and sorted through everything, a single look at the photos next to the pile of parts collected quickly convinced both of us that we needed professional help. Today, I sat in my Amish rocker as I typed some of these words... It actually looks better than it did before I started prying and yanking and pulling and levering it apart. It certainly feels sturdier. Sometimes I feel a little foolish for insisting and then going to all that work to get a. rocking. chair. (of all things) both over and back. Then I look at it (seems like I hardly have time to sit these days), my grandmother's quilt laying across the arm, the floodgate of memories opens and I remember just exactly why! What's the craziest thing you've ever carried overseas in your luggage? OH!!! I love love love this story!!! And I am so glad you got to keep your rocker!! There are just some things like that! I am not sure if I have brought anything crazy like that...although I did have to retrofit an action packer to bring my stand mixer down, which I use everyday here! 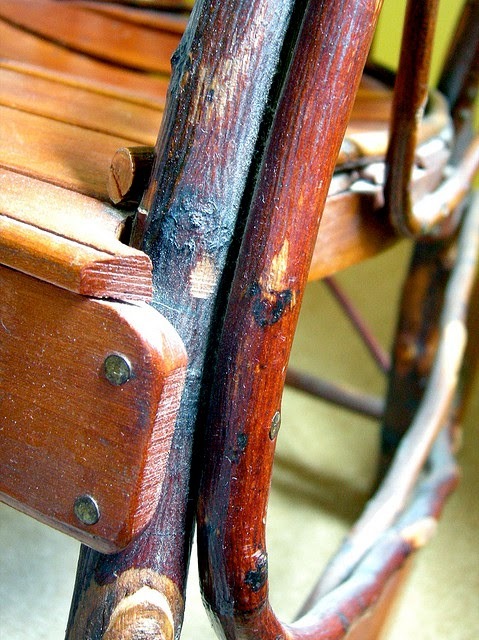 I echo Liz- I love this story and the fact that you still have your rocker!!! The most "unneccesary" thing we moved to Honduras was matchbox cars - HUNDREDS of them. Probably 50 lbs. worth or more. And we all know how precious each pound is! But with 3 boys and dad who is equally crazy about them (and nostalgic- most of them had been his as a kid), we just HAD to bring them. match box cars and little green army men was always something our youngest boy tucked into his carryon. He'd play with those for hours on the plane or at airports. :-) Totally get that one! Of course... he didn't bring 50 lbs worth. That's pretty amazing! And that they were equally important to hubby? That is a riot! Love it! Thanks for sharing!